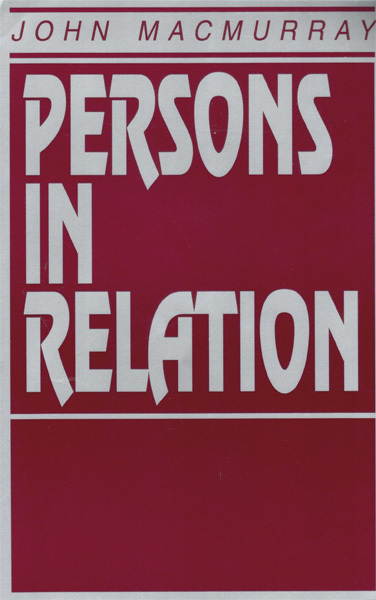 Persons in Relation presupposes the conclusions of The Self as Agent to complete Macmurray’s analysis of the form of the personal by establishing the Self as an agent constituted by his relationship to the Other, that is, by mutual relationships with other persons. Macmurray argues that an isolated agent is a self-contradiction because agency requires relationship with the Other as resistance and support to his actions in order to be able to do anything (i.e., in order to be an agent). In the first chapter, ‘The Field of the Personal’, Macmurray reviews the conclusions of the previous volume and identifies the areas where his argument requires further development. He then identifies the innate dualism of philosophical analysis that stems from the theoretical/practical distinction and includes scientific/philosophical knowledge and direct/indirect (or personal/impersonal) relations. In his consideration of the relationship between ‘Mother and Child’ in chapter 2, he concludes that an infant’s life is personal from birth. He posits that the child is not merely an animal organism but a person, a rational being, and his life and bodily survival depend on intentional activity, which is necessarily limited in the early days and must be supplemented by the mother with whom he is in active communication. Chapter 3, ‘The Discrimination of the Other’, considers the development of personal activity as the identification of the Other within an interrelated world, and Chapter 4, ‘The Rhythm of Withdrawal and Return’, continues this by focussing not on the negative aspect of differentiation but on the positive development of the person as agent. In chapter 5, ‘Morality and Its Modes’, Macmurray distinguishes among ‘pragmatic’, ‘contemplative’ and ‘communal’ morality, emphasising the latter as the only heterocentric (rather than egocentric) realisation of morality, and he extends this analysis in chapter 6, ‘Community and Society’, considering the form of the personal from a social rather than from an individual standpoint. He asserts that society is impersonal and arises from a common purpose, whereas community is constituted by persons engaged in a shared life. Chapter 7, ‘The Celebration of Communion’, focuses on the structure of community, and chapter 8, ‘Reflection and the Future’, explores the interrelation of personal freedom and self-determination. He concludes that, of the three forms of reflection (science, art and religion) only religion is personal because it represents the community of agents and regards the Other as both its means and end. Chapter 9 turns from the direct relations of persons (i.e., religion) to the indirect and hence negative as Macmurray considers ‘The Devices of Politics’, and in chapter 10, ‘The Personal Universe’, he defends the rationality of belief in God as ultimate reality and concludes that philosophy, which has abandoned dogmatism and certainty, is, in a new and wider sense, a Natural Theology.